I just wanted to do a quick post on mining x16r with a GTX750ti. The GTX 750ti is an older card and you may have one sitting around. I saw a post the other day asking if you could mine x16r with it. I had previously had a couple of these sitting around and had put them in my mining rig and they have been running trouble free. So thought I would share what I get for a single card after running a quick test. Disclaimer: This article is not financial advice, or instructions on how you should do anything, it is for entertainment purposes only. This site also uses affiliate links. This means I may make a small amount of money at no cost to you if you buy something after clicking a link on this site. 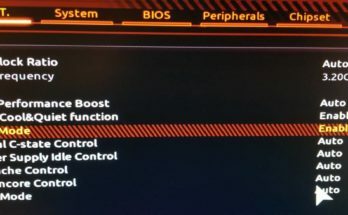 I took the stats below for a single GTX 750ti, although I am currently running a couple of them. You can find them really cheap used as they are a little outdated. The two I had were EVGA 2GB models in the closet after past upgrades. One nice feature is they did not take up any 6 or 8 pin power connections. They are powered by the PCI. 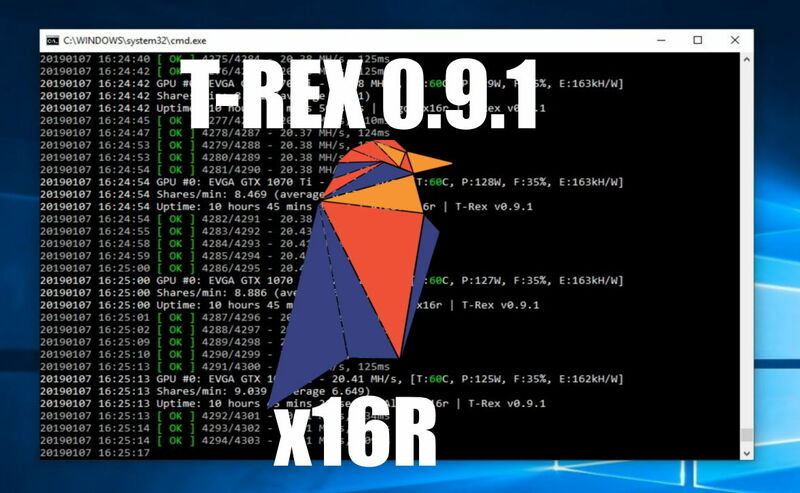 While everyone is probably aware you will not be able to mine as many coins as with a newer card such as a GTX 1060, I was surprised at how well it did mining Ravencoin (x16r). 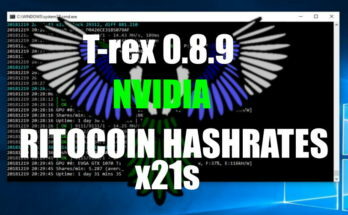 So what type of hash rates can you get? You can see below my single card was running around a 2.3Mh/s average. I did not try overclocking or adjusting the power for these readings. Running it by itself for about 10 .5 hours and I had mined about 3.5 Ravencoins. Now how many coins you get will be determined by the difficulty and the pool your mining’s on luck. I ran it about 18 hours and averaged about .38 coins an hour. Which will give you about 9 ravencoins a day. Using ravencalc I saw I could be getting about 14 coins a day with a single 750ti. So maybe I wasn’t that lucky and should have run it a little longer. But after about 18 hours I just put it back into the group with my other cards. I also might be able to squeeze a little more out of it if I overclock it, but not sure if it is worth the effort. 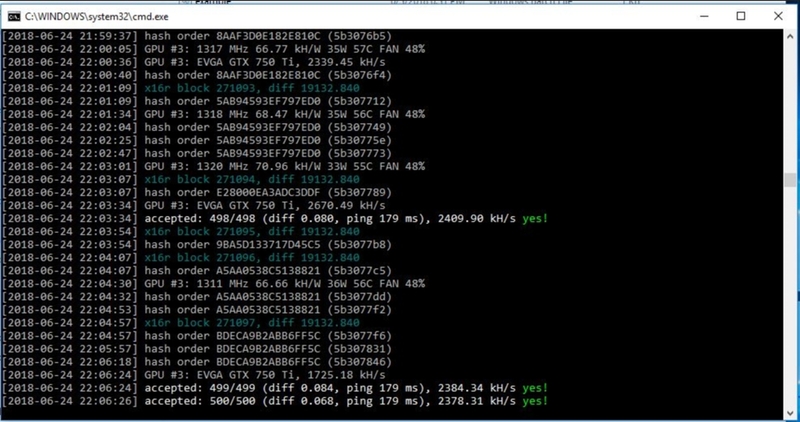 As for the mining program I tested the single GTX 750ti with is nevermore 0.2.3 which can be found on GitHub. Here is a screenshot while it was running. As for the settings I used in the batch file to start it. Here they are. I was running with an intensity of 17. I am not sure if I could go higher. I might play around with it a little bit. (the -d 3 was because it was the 4th video card in my system) You could remove that part. :: Note: May be unstable with intensity -i 21 and above. :: Set the developer donation percent with –donate. Minimum donation is 1%. 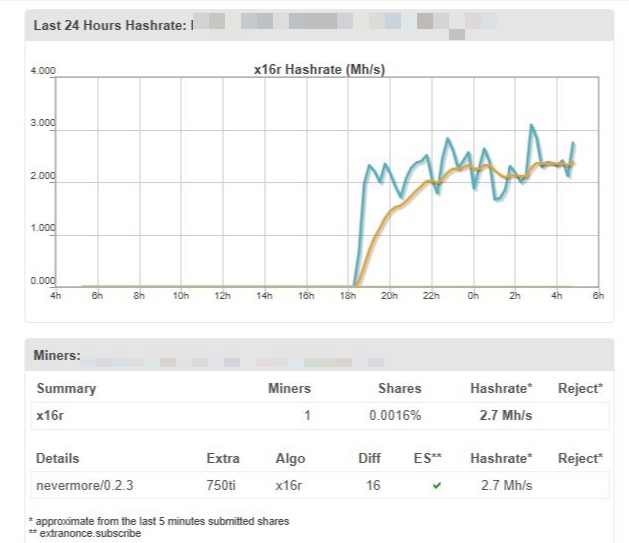 :: to get more stable average hashrate for x16r. Well, I am not really sure where I was going with this article. Mainly just testing an old video card for mining as you can find these for REALLY cheap used and maybe free. Maybe I will do an experiment and get a bunch of them and make a 750ti rig and see what it does. If I could get 4 more, I would be getting around 13.8Mh/s which is GTX 1070ti range. The downside might be the power needed to run it. I can compare that to my 1070ti and see how much of a difference it would be.. anyways, I guess I got a new project coming and need to start watching craigslist for them 🙂 . See if I can pick up a few for cheap to just play with. Anyways, if you have one and were thinking about mining with it. It is definitely possible if you feel like giving it a try. In case you were wondering, this is my current mining rig setup. My mining Rig GPU configuration. Ubit 12-PCS PCI-E Riser I only bought 6 of these, not a 12 pack. Currently I am using Windows 10 as the OS. Afterburner for the overclocking and power settings.